Ah, Kojima can do a trailer all right. This one—the E3 2015 trailer for Metal Gear Solid V: The Phantom Pain—is about as Kojima as a trailer can get. It's packed full of allusions to a theme; of weird looking people doing weird looking things; and of other Stuff That Is Happening. 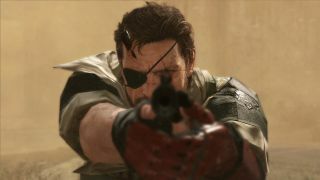 It's melodramatic as all get up, which is fitting for the end of Big Boss's saga, and for the end of a Kojima-led Metal Gear Solid series in general. It's all a far cry from the light-hearted open world antics reported on in our hands-on preview. But then, the Metal Gear Solid series has always placed itself in the space between serious and silly. There's plenty in this five-and-a-bit minutes for the series' fans (myself included) to get very excited about. I'm still slightly reeling from the implications of the "Les Enfant Terribles" section at the end. Roll on September 15, the date that The Phantom Pain arrives on PC.